(CNN) - The president of the AFL-CIO will lambaste Sarah Palin on her home turf Thursday and is set to call the former Alaska governor a "crazy magnet that's pulling people to the right." "She used to have a job, your governor. You knew her–or thought you did, I know I thought I did," AFL-CIO President Richard Trumka will say during a speech in Anchorage according to his prepared remarks. "She seemed like a decent person, an outdoorswoman. Her husband's a steelworker. She seemed to take some OK stands for working families." "And then things got weird. After she tied herself to John McCain and they lost, she blew off Alaska. I guess she figured she'd trade up-shoot for a national stage. 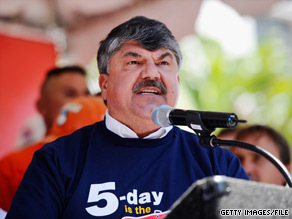 Alaska was too far from the FOX TV spotlight," Trumka will say. "I bet most of you, on a clear day, can see her hypocrisy from your house." Trumka is in Anchorage for a convention for AFL-CIO families. The focus of his speech is jobs and the economy, but several minutes of the speech is devoted to blasting the former vice-presidential nominee. Trumka will also mention a term Palin has coined to describe female candidates that she endorses. "The Mama Grizzlies, Sarah Palin says, just sense when something's not right," Trumka will say. "Well, I wonder if those Mama Grizzlies can sense something's just not right with her." Thank you, Vince [Beltrami], for welcoming me here to be with the men and women of the Alaska AFL-CIO … . [To Vince] And thank you for giving me the opportunity to join you, my brother, here at your convention. It is an incredible honor to be here with ALL of you—the hardest-working men and women in Alaska …. And it’s a pleasure to visit a place where so many of our working families are still working, thanks to an economy that’s a lot like your great state—huge and quite a distance from the lower 48. It’s not pretty down in the Great Recession, in the worst national economy in 75 years… 15 million Americans are out of work. Half of them have been unemployed for longer than six months. And as many as 26 million Americans are under-employed, working any job they can find for a fraction of what they once brought in. Eight percent unemployment in Alaska is not perfect, either, although I hear that your prognosis looks OK – modest job growth in the year to come. That’s why it’s so important that we continue to stand together…. We’re stronger together. We can secure our futures together… for ourselves, for our children and grandchildren…. We don’t back down… for anybody… or let anyone stand in our way. “Outperform.” You know what they mean by that: They scrape that extra few dollars off the hides of the working men and women who clean the rooms and launder the sheets, who staff the desks and cook the food…. Remington’s one of the biggest union-busters around. Remington’s up to their old tricks here in Anchorage. It’s more of the same…. They’re trying to drive out UNITE-HERE, so they can drive down wages and benefits. So we’re going to stand together until we win for the workers and their families at Anchorage Sheraton, until we show Remington that’s not how things are done in Alaska. And when we win right here in Anchorage, we’re going to win for every working family in America, because we’re not backing down…. And that’s how we’re going to defend our union way of life together. And across America, we’re going to rebuild our middle class with a simple, one-word plan called jobs. Remember John F. Kennedy’s line about the rising tide that lifts all boats? He wasn’t talking about a bubble economy or a Reagan economy. It’s working people—working people—who are the tide. Good jobs are the tide. When working people rise, so does our economy. That’s our goal. And we’ve made real progress in Washington in the last 20 months. I want to talk for a minute about the Obama administration: Without the Obama recovery plan, we'd be in a full-blown depression. The Obama administration has already created more jobs — even in this weak recovery — than were created during the entire 8 years of George W. Bush. … and Obama’s executive action to reverse the Bush ban on PLAs … and to prohibit federal contractors from using funds to block union organizing …. Let’s not forget the great work by our new Secretary of Labor to stop the misclassification of employees by cut-rate contractors. That’s a record, a real foundation. It’s something to build on. But it’s not enough. It’s nowhere near enough. To be frank with you, a lot of us anticipated that Congress would have moved faster. That maybe, by now, we would have seen some serious job growth … major investments to rebuild our crumbling education system, our transportation infrastructure, our rail systems. These are the essential investments we’ve called for to rebuild America. But let’s be clear about why we haven’t seen more. Most of what we see is Republicans fighting Democrats … and sometimes they’re joined by a few Democrats … and we’re living the fall-out. Here’s the problem. Every time the Democrats and President Obama have proposed jobs legislation, they’ve been blocked by crass maneuvers from the most politically motivated Republican minority we have ever seen – and I really do mean ever. Look at Sen. Lisa Murkowski’s voting record. She’s marching too close to her party’s leadership, too far from Alaska. Instead, she’s hanging out on cable TV, almost a parody of herself, coming out with conspiracy theories about Obama and his “death panels….” Talking about “the real America.” Talking about building schools in “our neighboring country of Afghanistan.” Writing speech notes to herself on her hands. Sometimes – about Sarah Palin – you just have to laugh…. But it’s not really funny. In this charged political environment, her kind of talk gets dangerous. “Don’t retreat… reload” may seem clever, the kind of bull you hear all the time, but put it in context. She’s using crosshairs to illustrate targeted legislators. She’s on the wrong side of the line there. She’s getting close to calling for violence. And some of her fans take that stuff seriously. We’ve got legislators in America who have been living with death threats since the health care votes. And down in Tyler, Texas, she’s talking about—and I quote— “union thugs.” What? Her husband’s a union man. Is she calling him a thug? Sarah Palin ought to know what union men and women are. Oh, she goes to great pains to talk differently about unions and the working people who belong to them, knowing full well we’re one and the same. But using the term “union thug.” That’s poisonous. There’s history behind that rhetoric. That’s how bosses and politicians in decades past justified the terrorizing of workers, the murdering of organizers…. To me, it just doesn’t seem OK to go where she’s going…. It sits wrong with me…. The Mama Grizzlies, Sarah Palin says, just sense when something’s not right. Well… I wonder if those Mama Grizzlies can sense something’s just not right with her. Quite frankly, America works because lots of people contribute lots of ideas—that’s good—even when some of them are just plain wrong. But people need to come to the table in good faith. That’s not Sarah Palin. She’ll go down in history like McCarthy. Palinism will become an ugly word. Who is this woman, anyway? What happened to her? I can tell you one thing: There’s no question about who we are. We’re right here. We’re everywhere. We’re working people standing together to rebuild America’s middle class. You don’t get there with a cable career, or with the Party of No. We’ve got a one-word plan called JOBS! But we’re not going to get our jobs unless we get the right people in Juneau and the right people in Washington. You’ve got to get Sen. Murkowski loose from Palin’s crazy magnet. You don’t want her to get that far out, too. Now, you all have made some important progress in Alaska. You’re 10 and 10 against our opponents in the state senate – so with one critical win, you could change the whole dynamic of the legislature. That’s how Senator Murkowski will get the clear message that it’s time to represent Alaska, she’s got to represent working families again, not just the U.S. Chamber of Commerce. We need a strong showing everywhere…. A clear call for progress…. And let me tell you why: Because if we win these elections on November 2, it’ll strengthen us to fight on November 3… and the next day… and the day after that… for the jobs we need, for the economy we need. Nobody’s going to give us anything. And people who want better have to understand: If Alaska and America are going to create new jobs with rising wages, stable benefits and promising futures, we've got to work for it. If you believe that keeping jobs in this country matters, and in returning America to a country that makes things again, work for it. If you believe that America must invest in transportation and technology, education and the environment, work for it. If you believe that Wall Street got us into this mess and now must pay its fair share of the costs to get us out, work for it. Work for it. Stand for it. Stand together. March together. Fight together. Win together. And don't let anyone—anyone—stand in our way. I can think of no higher honor for a politician than to be "slammed" by a union. This almost makes me want to vote for Palin.